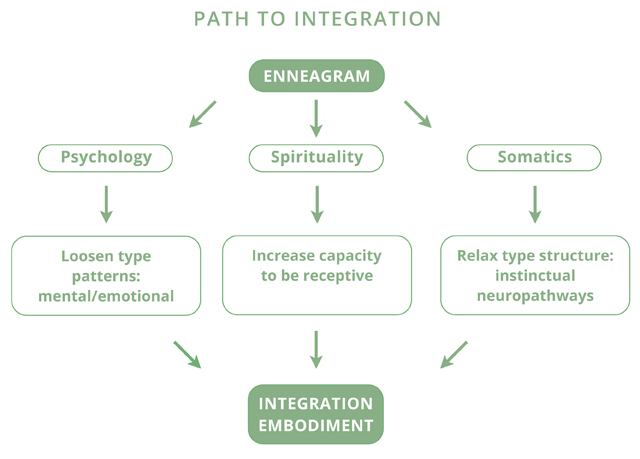 From the beginning of Helen and David’s Enneagram Professional Training Program in 1988, the Enneagram was offered as an important tool for integrating two of these realms: psychology and spirituality. In her first book The Enneagram, Helen states, “The Enneagram is a part of a teaching tradition that views personality preoccupations as teachers, or indicators of latent abilities that unfold during the development of higher consciousness.” While our early programs also included elements of body work such as Aikido or breath practices, we made a big leap forward in 2007 with the help of Core Faculty member Marion Gilbert by incorporating somatic methods alongside psychology and spirituality. The Enneagram map is elegant in providing insights into all these areas. It names the virtues and the holy ideas in the spiritual realm. We work on developing ways to be more receptive so we can receive grace, or whatever name you give to the mystery of life. To be receptive, there needs to be some freedom from the conditioned type patterns through which we usually greet the world. In the realm of psychology, the Enneagram identifies habits of mind, driving emotional energies, defense mechanisms, idealizations, avoidances and many other patterns that are type-related. Our trainings include methods to help us loosen our type structure. Instinctual energies and automatic physical responses that lie in the realm of somatics also impact our type. When we experience discomfort as we begin to change, we have somatic methods to assist us. Incorporating psychology, spirituality and somatics brings wholeness into our curriculum. When methods and practices illuminated by type are applied in each of these three areas and their interrelationships are made explicit, growth occurs. They play off each other to bring change that can’t be achieved by focusing on just one area. For an overview of the guiding principles underlying our courses, see the diagram below. My passion is bringing psychology, spirituality and somatics together, and working with them simultaneously so we can use this profound system to transform lives and create a compassionate world. Thank you for your insights. This way of working with the Enneagram is what brings my passion for the work alive. It is profoundly transformational. I would like to do more training in this area…so one day ..in Australia perhaps!! Wow! I love what you’re doing! Finally someone is bringing everything together in a way we can effectively work with the gifts and challenges of our type! Without the somatic piece it’s almost impossible to make any lasting personal change. I’m so glad I discovered your well built site and positive approachable body of work.